Writer? Me? 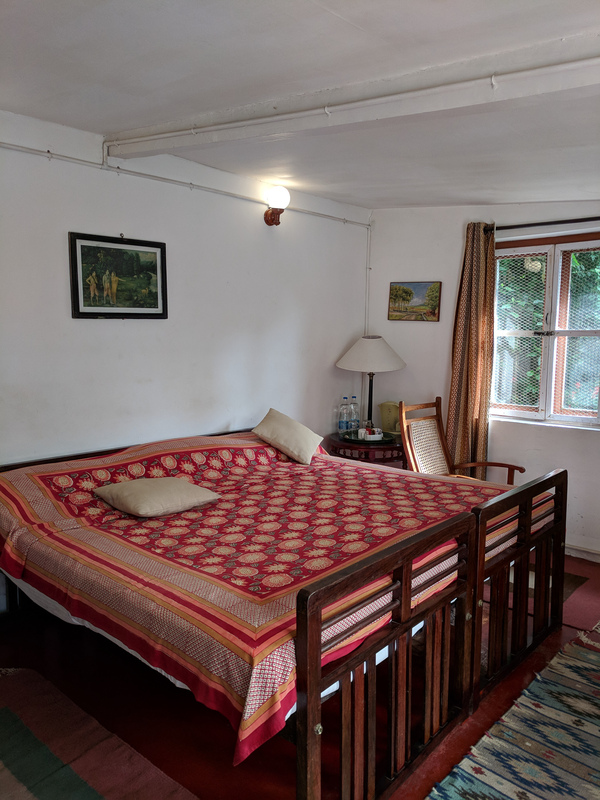 I was so chuffed at being called a writer that the rest of Geetha’s words about the room and its amenities didn’t register as I was mentally preening. Till she mentioned the word “room heater”. I snapped out my self-absorbed reverie to see her pointing towards the said contraption and showing me how it worked. “Surely, I won’t need this, right? I asked. I may also have giggled nervously. “I’m afraid you will for it gets very cold after sunset. Besides, there are extra blankets and quilts in the cupboard should you need them,” Geetha said seriously. 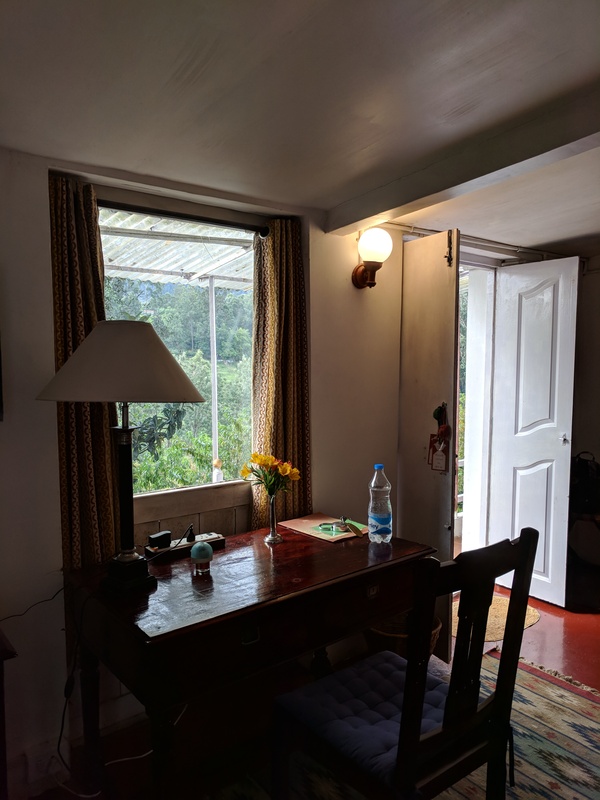 “You did read the mail we sent about the weather and appropriate clothing for Coonoor, didn’t you?” I hadn’t read the mail, but wasn’t going to tell her that. “Of course, of course,” I said airily, ushering her out of the room.”I’ll be fine and will manage”. That night I needed two blankets + one quilt + the room heater to “manage”. I don’t know when I stopped shivering and went to sleep. I woke up the next morning to the most awful racket; it took me a few seconds to figure out that the sky wasn’t about to come crashing down on my head and that it was a family of monkeys partying on the roof. And that’s how my holiday at Neemrana’s Wallwood Garden began ! Wallwood Garden was built by a Scottish military man in the British Army over a 100 years ago, who named it Blair Atholl after the village he hailed from in Scotland. 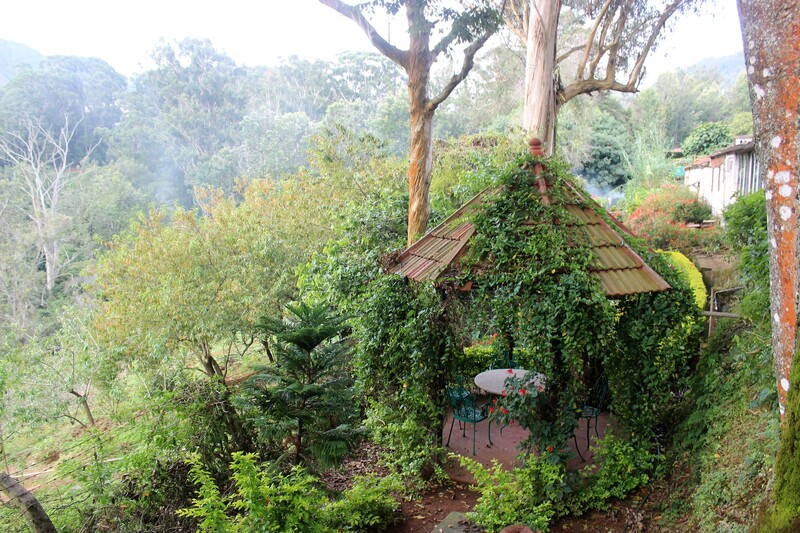 Wallwood Garden has changed ownership since then and is now owned by a tea company. The warm and welcoming white-washed bungalow is set amidst a large garden with well-laid lawns, trees, flowering bushes, wildflowers, etc. and the rear of the bungalow overlooks a tea garden. 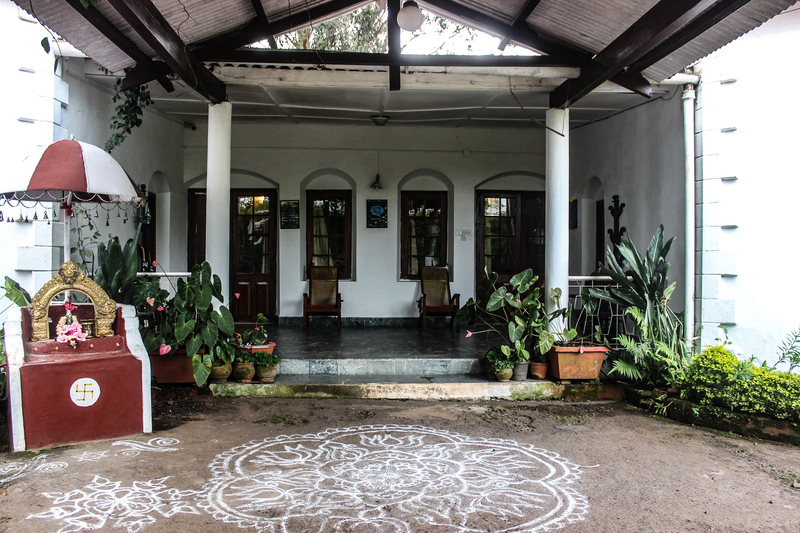 A large kolam and a Ganesha shrine welcomes guests and visitors to Wallwood Garden. 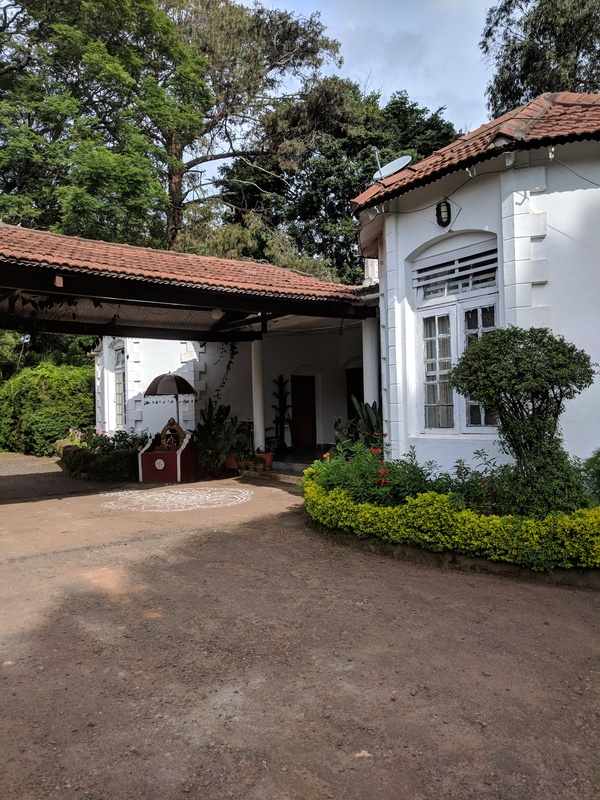 There is an annexe to the main bungalow, which would, perhaps, have served as residential quarters for the large number of help needed to run the house in the past. 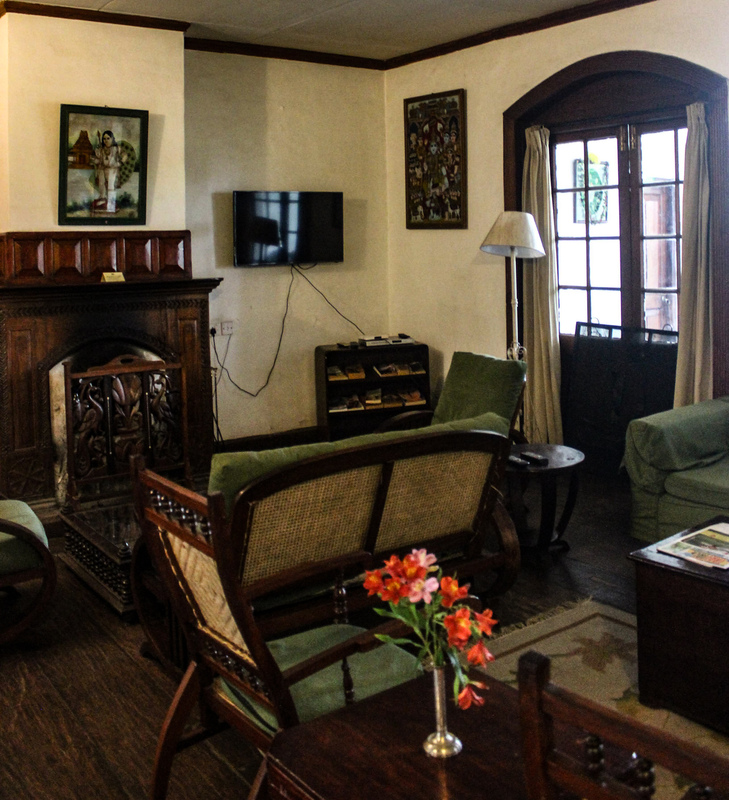 These days, the annexe houses the suites and single rooms like the one I stayed in. All around the property are strategically placed chairs that urge you to sit and relax. My personal favourite was a little gazebo that I could see from the sit out outside my room. 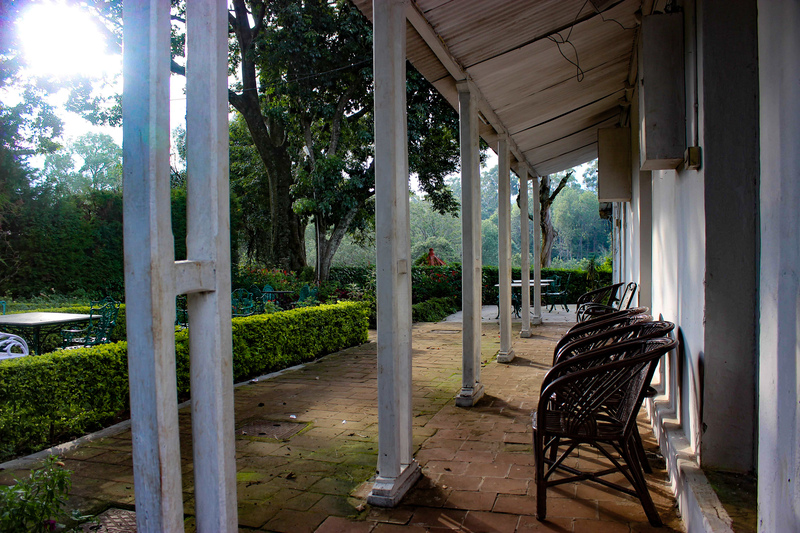 I loved sitting there and reading and sometimes writing my travel diary, listening to the conversations of the tea garden workers across the fence. I got to hear a lot of local gossip that way ! 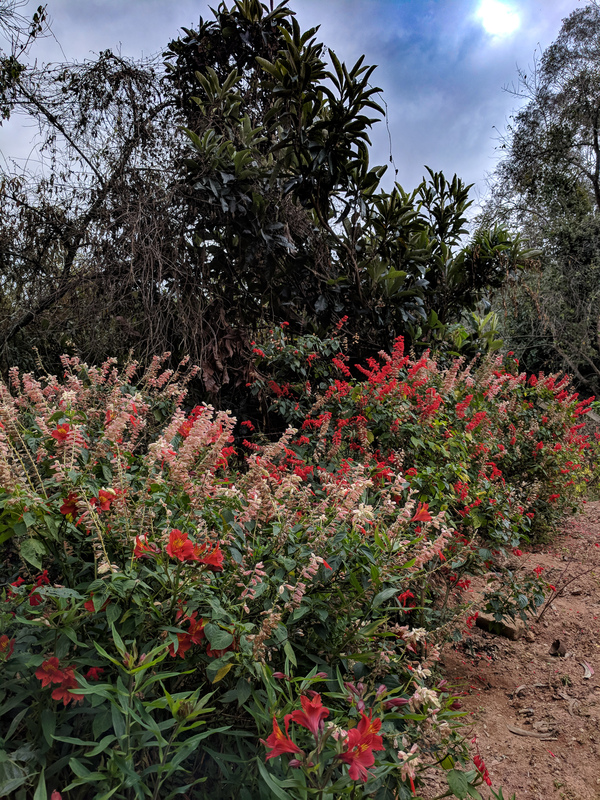 Another view of those flowering bushes. No idea of what they are though. Stepping into the Wallwood Garden is like stepping into the past, never mind modern appliances like the TV and the CCTV cameras. 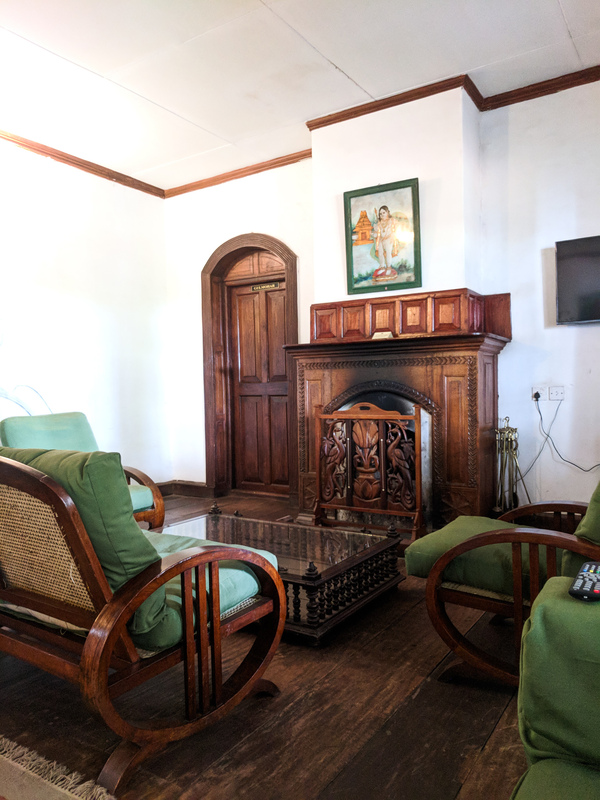 It is a beautiful, well ventilated bungalow with many original features like wooden floors, a fireplace, wooden doors and windows, some wooden furniture and wooden molding on the ceiling. Some of the rooms have red oxide flooring, which also appear to be quite old. 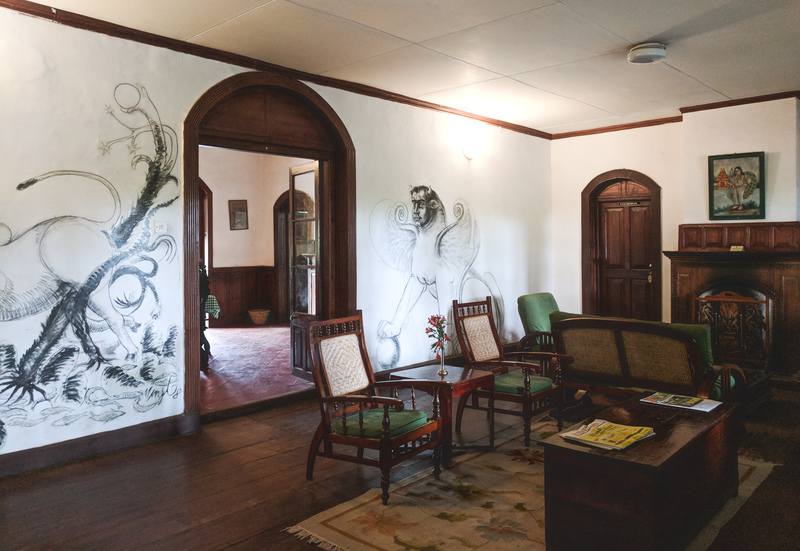 All the walls are painted white to best display the various artwork and also showcase the two charcoal sketches in the living room. 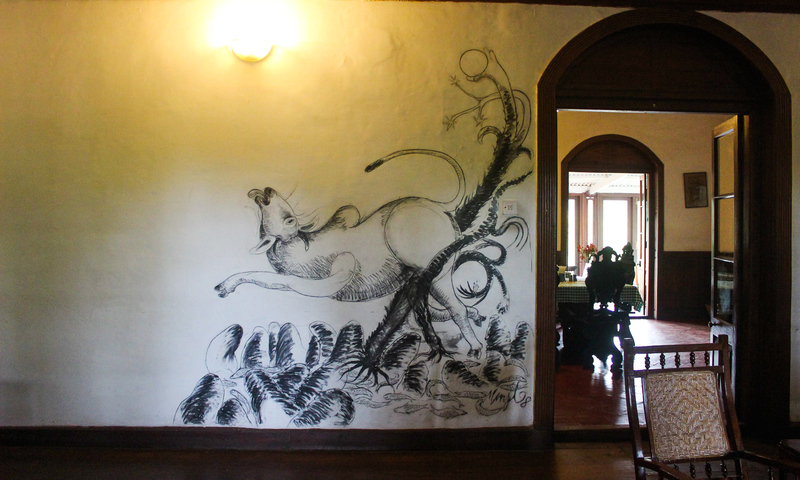 One of the sketches is of a rodent or squirrel like animal, which I initially thought was the Malabar squirrel, but the tail is all wrong, so am not sure. The second one is rather, bewilderingly, what looks like a sphinx. I don’t know what was the idea behind these sketches, but it does definitely add a bit of quirk to the space and am sure has been a conversation starter among guests in the living room. Another view of the living room and the fireplace. Can you imagine a wet winter evening with a roaring fire, a book in your hand and some warm brandy or mulled wine? Squirrel? Some other rodent? Malabar squirrel? 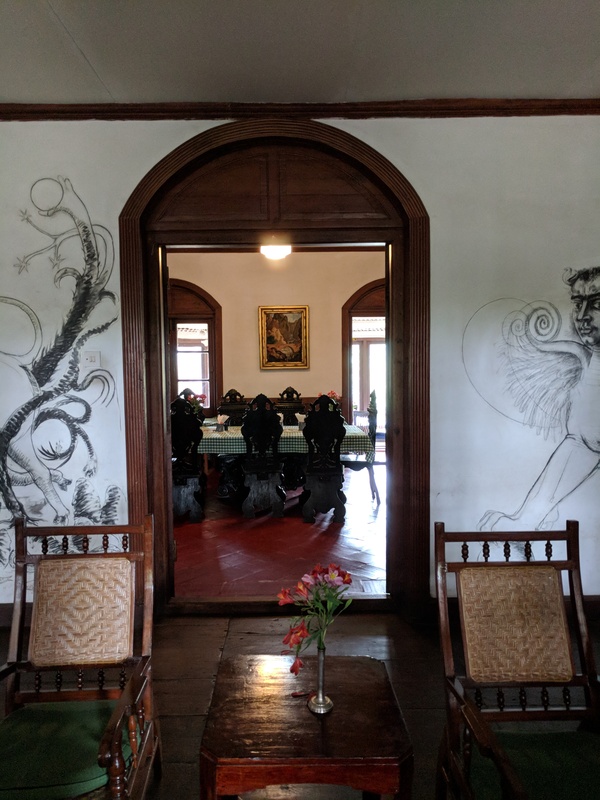 The arched doorway that leads to the formal dining room and other rooms. 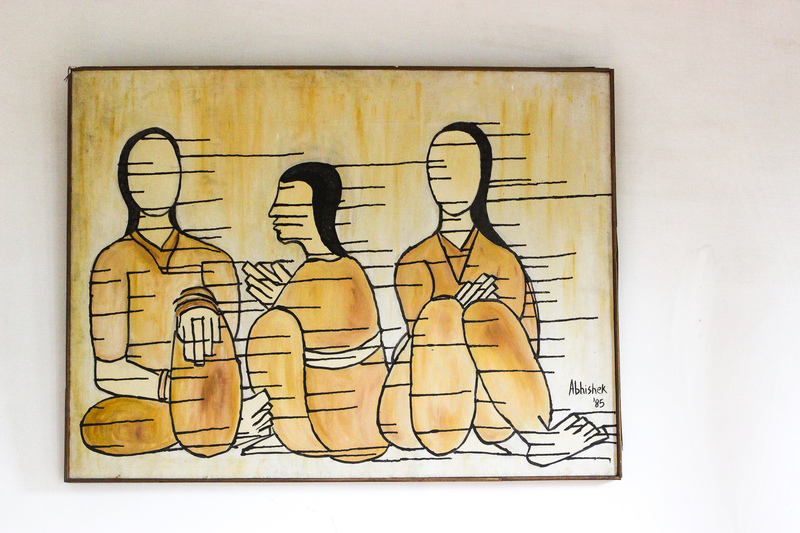 One of the reasons I like visiting and staying at the Neemrana Hotels is that they display a lot of art in their properties. And Wallwood Garden lived up to that reputation and didn’t disappoint me. 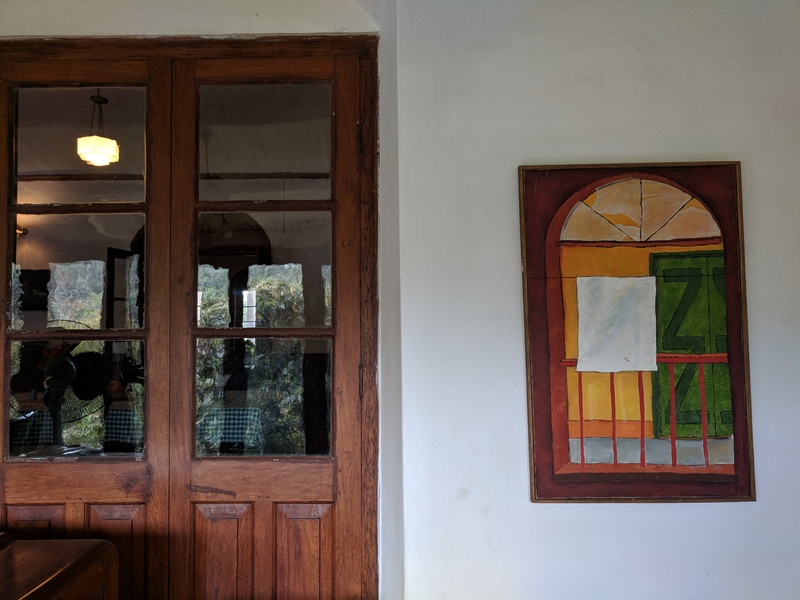 Every room had its own works of art and no two pieces were alike. 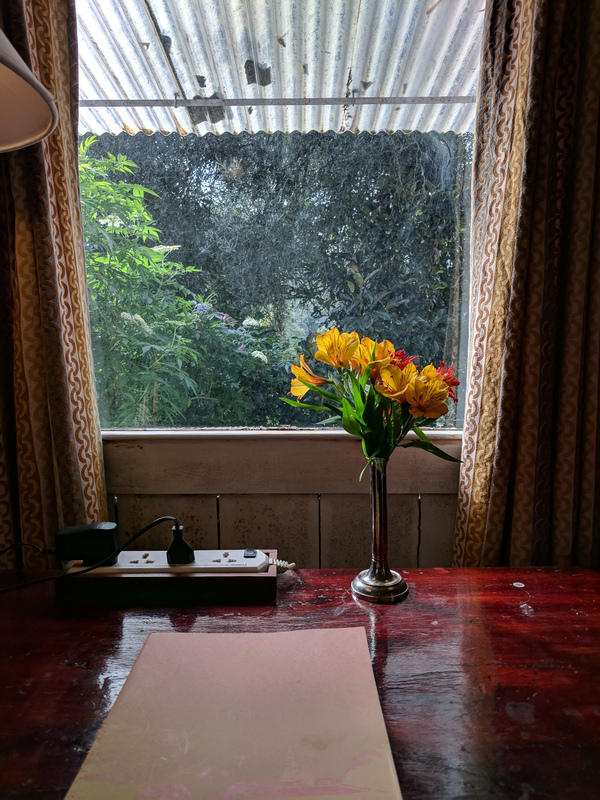 From embossed and framed silver work to lithographs to dressed oleographs to a Kalighat painting to some contemporary and modern works, Wallwood Garden had it all. Whoever chose these works of art surely has an eclectic taste. 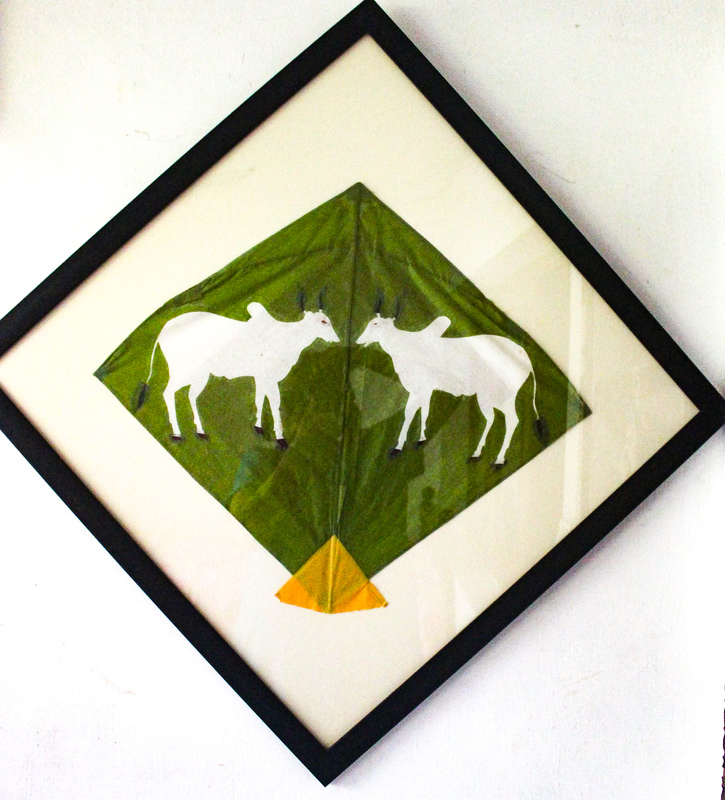 My personal favourite was a set of framed prints devanagari letters, something I had never seen before. Part calligraphy and part illustration, they were stunning and I loved the detailing in all of them. 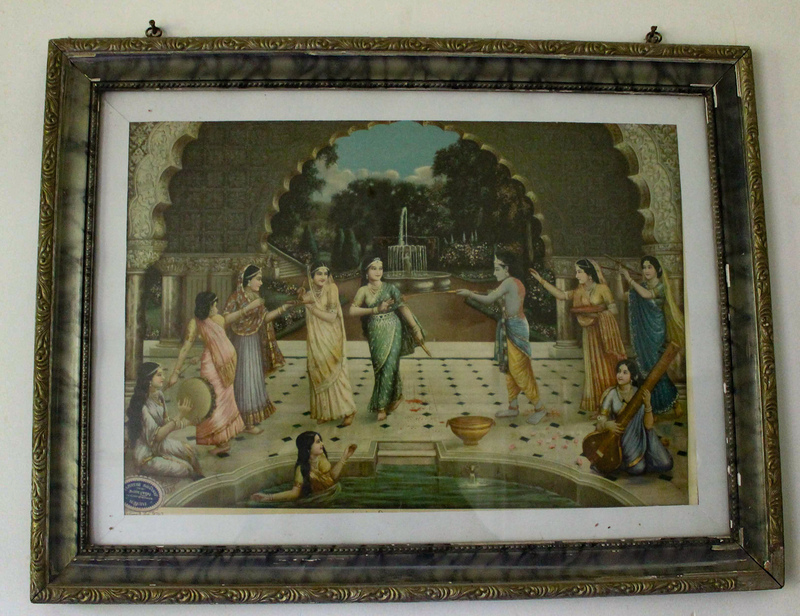 Unfortunately, I couldn’t fully understand the accompanying text as it was in Sanskrit and parts of it were faded but I’m in the process of getting it translated, so hope to share more about them soon. 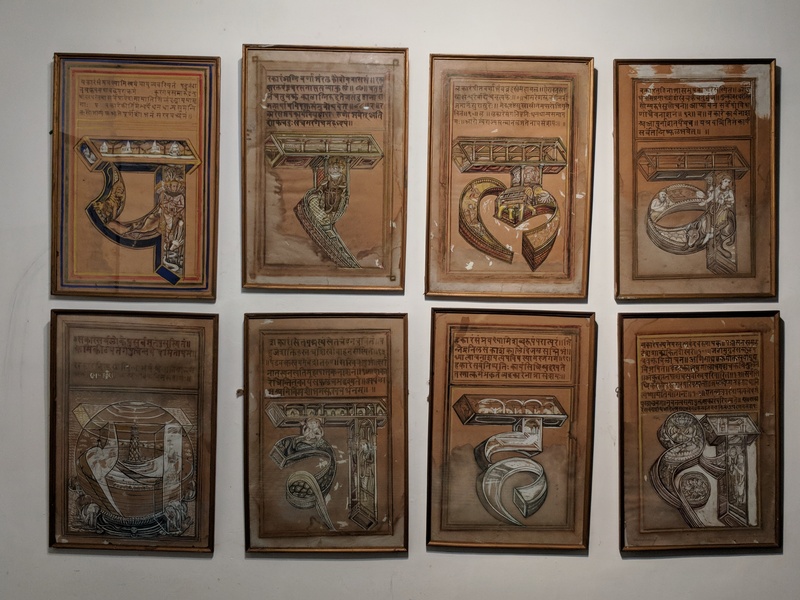 This has to be one of the most fascinating works of art I have come across – illustrated letters from the Devanagari script. 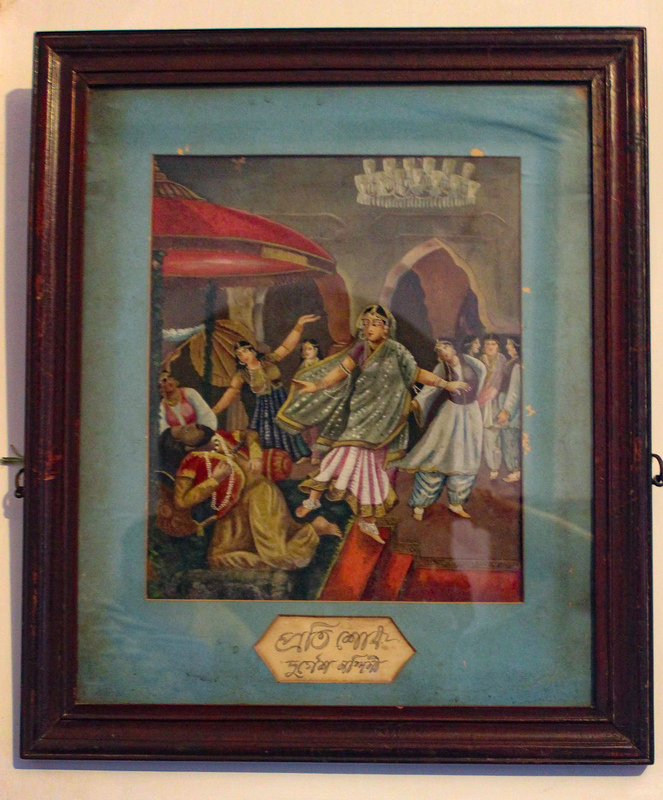 A vintage print of a Kalighat painting depicting a court scene. 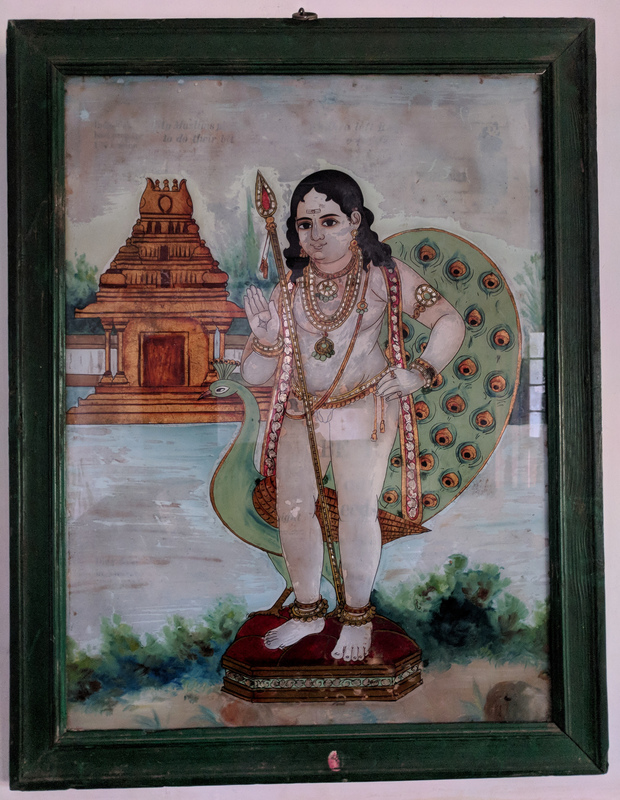 A vintage print of Kartikeya or Murugan as he is known locally. 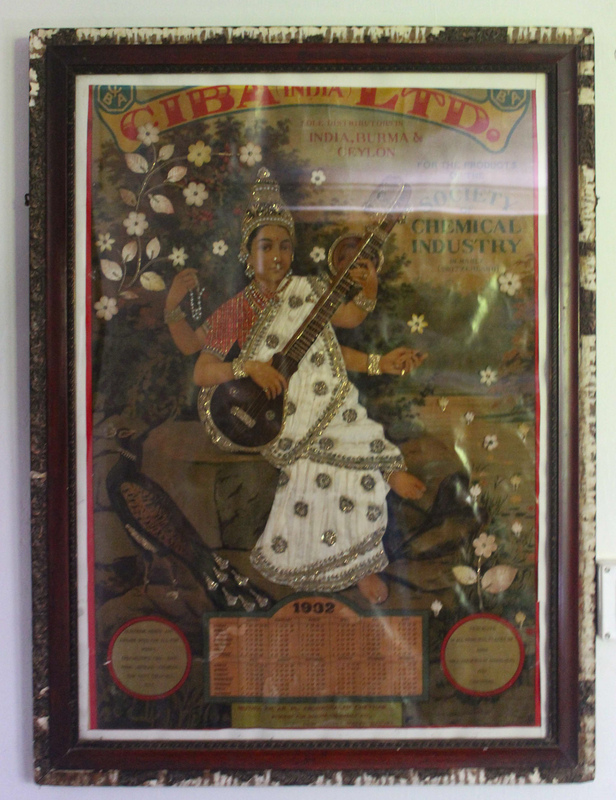 A dressed oleograph of Saraswati dating back to 1932 ! I quite liked this quirky ‘kite art’ and how an ordinary kite has been jazzed up for use. I don’t particularly care for the cows; rather it is the idea that makes this so interesting. 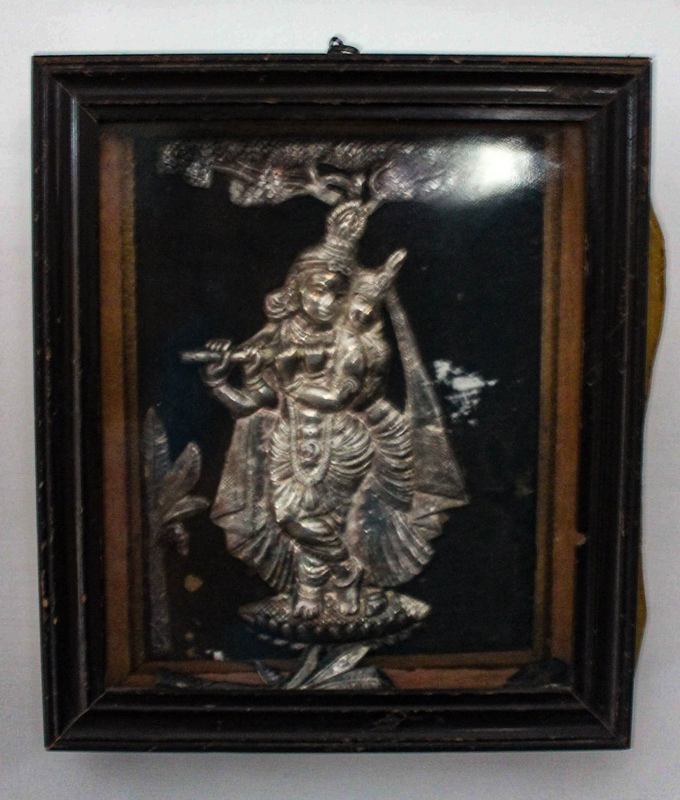 A silver foil embossing of a Radha Krishna. These used to be quite popular in the 1960s and 1970s, but haven’t seen art like this in the recent past. More than the art on the right, it is the placement that caught my eye. 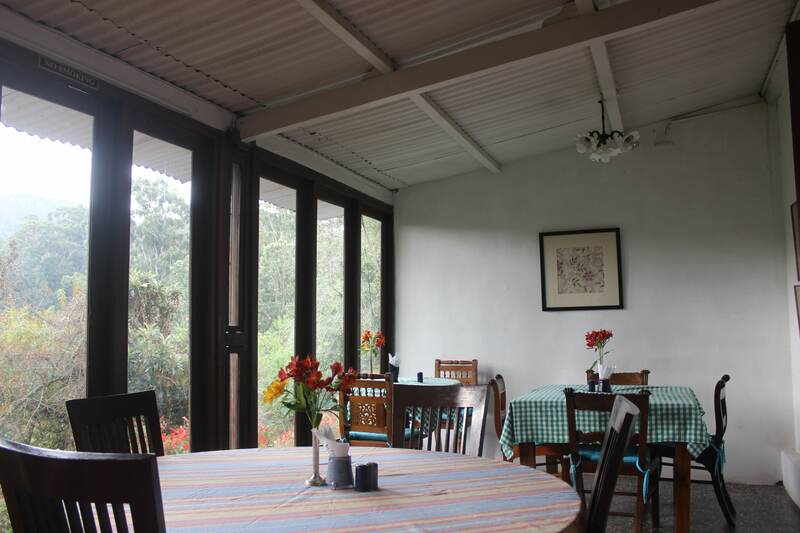 My days at Wallwood Garden would begin with an enormous breakfast just the way I like it. 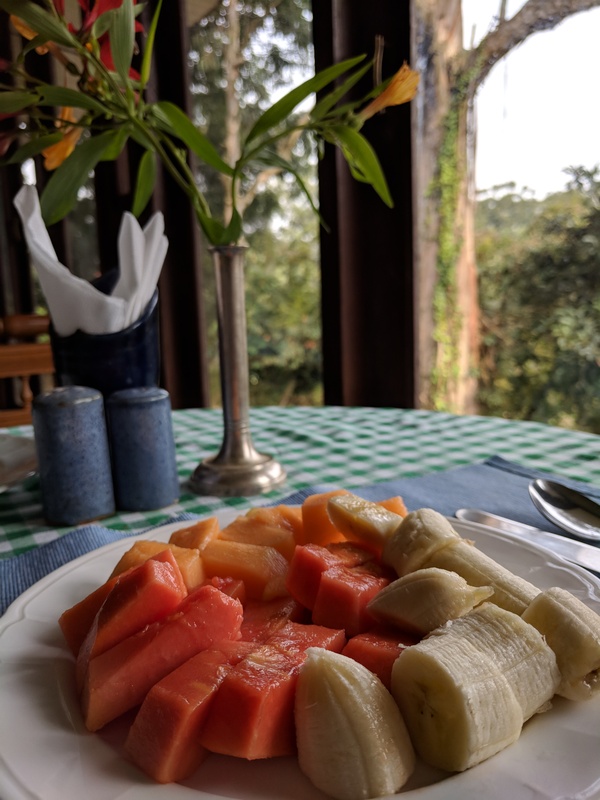 Fruits and the breakfast special of the day — idli or dosai or puri bhaji — followed by hot and fresh filter coffee. Yes, yes, I know I was in tea country, but I’m first and foremost a coffee kinda person. I had most of my meals at Wallwood Garden itself. It was not just because it was convenient, but because the food is simple and delicious and just the way I like it. I must mention that if you’re looking for restaurant type variety then you will be disappointed for the menu is fairly limited which is another reason I liked having my meals at Wallwood Garden. What gets cooked on a particular day is dependent on which fresh produce is available. So, on one of the days I was there they has some fresh vazhakai or raw bananas and they made a delicious dish out of that for me. 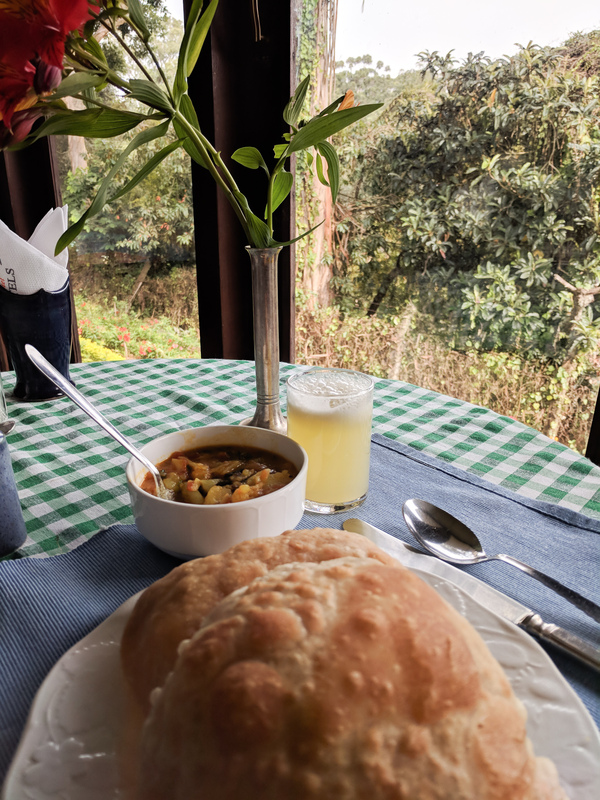 Everything is cooked from scratch and one does have to wait a bit, but with fabulous views from the dining room, not to mention a book to read or catching up on writing my travel diary, the wait never seemed like forever even though I was alone. Puri and bhaji. The best breakfast at Wallwood Garden. 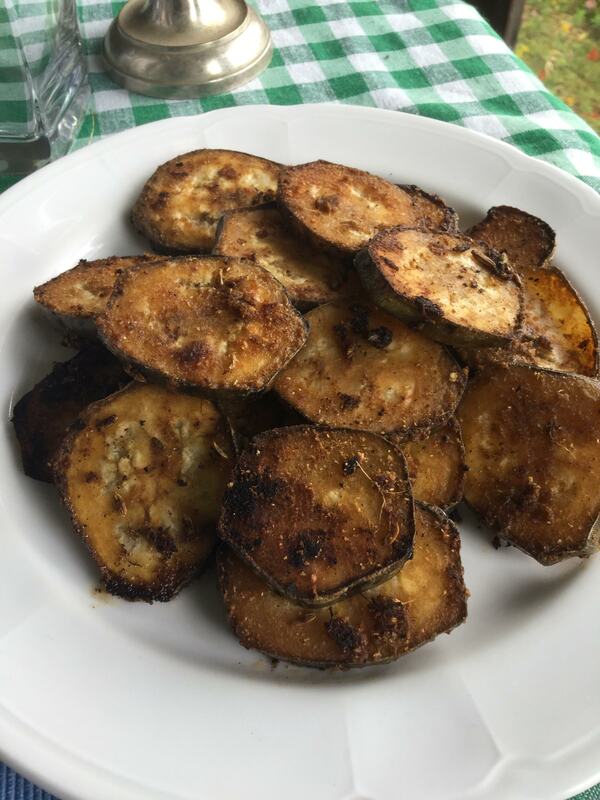 Vazhakai Vazhuval – a roast vegetable prepared from raw bananas and tossed with spices. Absolutely delicious ! Note: When I’m at a hotel as part of a sponsored trip or as an invitee, I wonder if I’m getting special treatment. I keep an eye out for how other guests are being treated and that pretty much tells me how the hotel and staff really are. It was reassuring to see that all the guests were treated the same. 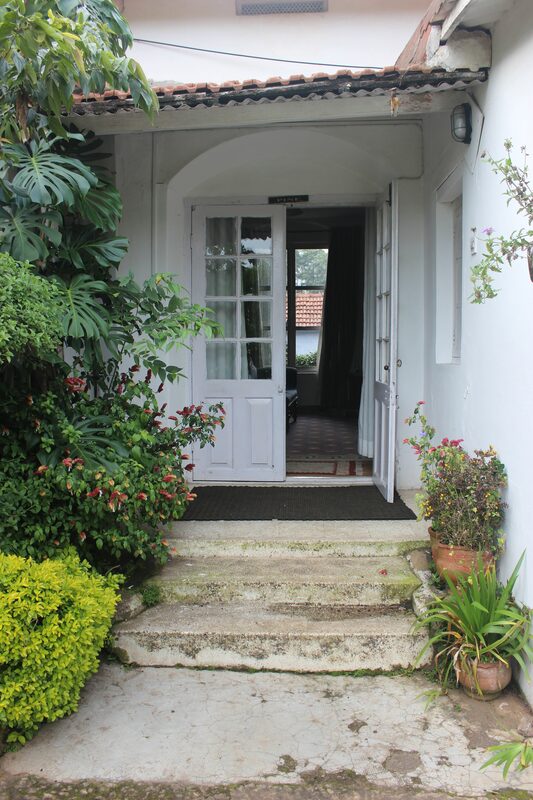 Thank you Geetha and the staff at Wallwood Garden for your hospitality and for such a wonderful stay. 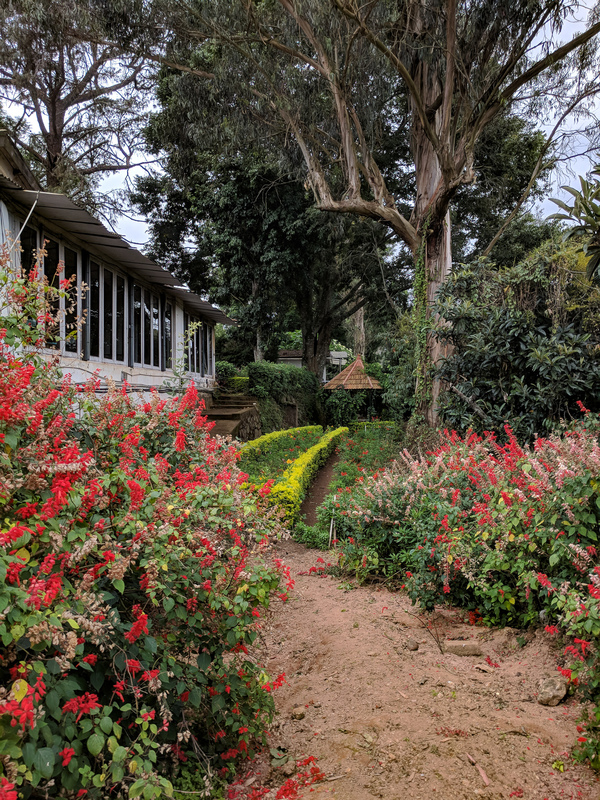 Disclaimer: I was hosted by Neemrana Hotels at their Wallwood Garden property in Coonoor, Tamil Nadu, in exchange for a post on my experience there. The words and photographs are all mine, and I was not compensated financially or in any other way by them. Oh yes ! The furniture was quite solid and the chairs in the formal dining room had some rather intricate carvings. Somehow I missed taking pictures of them. Welcome here, Nomadosaurus. Thank you for stopping by and commenting. 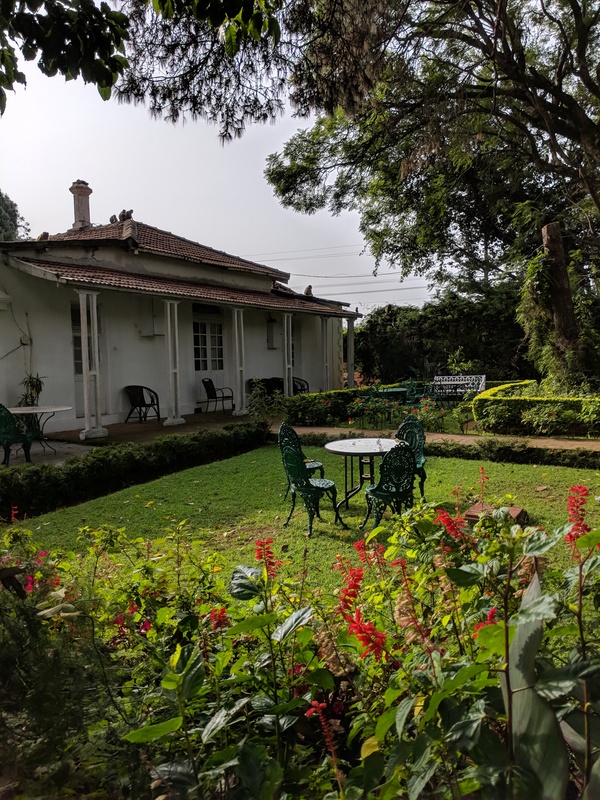 Neemrana’s Wallwood Garden is indeed very beautiful and comfortable and was quite the perfect base to not just explore Coonoor, but the Nilgiris too.